Bay Area-based Blue Bottle Coffee has announced that it will be opening two cafes in San Diego in 2019 - first in Carmel Valley’s vibrant new retail community of One Paseo and a second in downtown's Tower 180 office building. Blue Bottle Coffee was founded by James Freeman in Oakland, California, in 2002. A self-declared coffee lunatic, James hand-roasted beans in a 182 square-foot potting shed and then delivered them to friends from his Peugeot wagon. 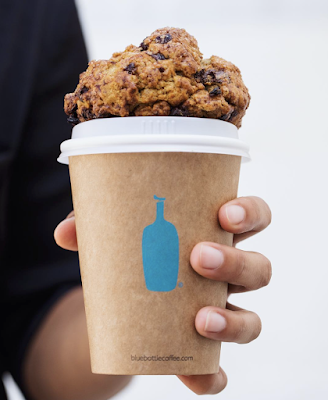 Sixteen years later, Blue Bottle is now 68% owned by Nestlé (at the cost of about $425million) and has a network of cafes in the Bay Area, Los Angeles, New York, Washington D.C., Boston, Miami and Japan. "We’ve been looking for the opportunity to begin serving our customers in the San Diego area and are pleased to have found two such ideal locations for Blue Bottle Coffee," said Bryan Meehan, CEO of Blue Bottle Coffee. "San Diego is a community of free-thinking, adventurous spirits and we’re looking forward to the opportunity to connect with a community of coffee drinkers excited about specialty coffee." Joining an already impressive roster of dining & drinking tenants, Blue Bottle's One Paseo cafe will face a central courtyard and offer bountiful interior and exterior seating. Large windows will allow for expansive natural light and light-colored interiors with low profile equipment follow the Blue Bottle ethos of drawing attention to the coffee and allowing the customers and baristas to connect in meaningful conversation. The One Paseo cafe will also serve as the region’s training lab, offering space for new Blue Bottle baristas to learn the art of pour over, espresso and milk foam. "One Paseo couldn’t be more delighted to welcome Blue Bottle to our collection of culinary and lifestyle shops," said Nelson Ackerly, Senior VP of One Paseo developer Kilroy Realty. "Being the location for their first brick-and-mortar in San Diego gives us a jolt of excitement, just like the careful curation and innovation behind their coffee. We can’t wait to sip Blue Bottle's freshly brewed coffee while enjoying everything One Paseo has to offer." In its new San Diego cafes Blue Bottle Coffee baristas will serve beverages including coffee, espresso, cold brew, New Orleans-Style iced coffee, and a selection of pastries including Liège wafels and toasts. Cafes will also host reoccurring coffee education classes taught by expert baristas where guests can learn about coffee brewing techniques and the nuances of different varietals and coffee types through coffee cupping - or coffee tasting - classes. For more information, visit bluebottleecoffee.com.